Combined, the two markets will generate billions of dollars in sales and create tens of thousands of business opportunities. The changing business climate will lead to new challenges, struggles and, potentially, failures for companies and the individuals behind them. 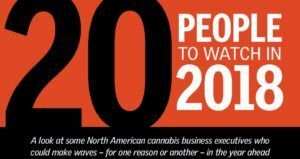 As we hurtle into 2018, the editorial staff at Marijuana Business Magazine – which is published by Marijuana Business Daily – singled out 20 executives in the cannabis space who bear watching in the year ahead. To be sure, there are scores of executives who could be included on this type of list. It’s by no means comprehensive, nor is it meant to “rank” executives in any fashion. Their company is planning or poised for significant expansion. Their business is encountering fierce business or financial headwinds. Their company is staking out a new path for the marijuana industry. Their business is positioned to capitalize on the launch of a major new marijuana market. The individual is positioned to influence key marijuana regulations and policy. For all the reasons listed, you are missing probably the most important person to watch this year: Jon Cooper of Ebbu. He is leading the company that will redefine what it means to have consistent and reliable effects from the cannabis plant. I think you left out one. How about Derek Peterson of Terra Tech Corp ? How could you POSSIBLY omit Kyle Castanon, CEO, Palomar Craft Cannabis…? A marketing whiz if ever there was…getting top returns on premium quality product. The Magic is out of the bag now and we will start to see some real consciousness, social consciousness on how the herb creates a Virtuous Economic Cycle everywhere he walks. The growing, producing and manufacturer of hemp based fuel, fiber, food, medicine and the most highly regarded recreation substance known to humanity is the Economic Revival of Direct Democracy. We can and will grow our own economic Destiny. We are the most effective JOBs program ever. The Marijuana Movement is the only viable political movement in Nation. We are the cutting edge of Direct Democracy and have overcome the Cops, the Religions, the Politicians and the Media with our Voices, Plebiscite. What about budtrader.com? They have more users then anyone and more traffic then Massroots. How come no one is talking about them? Perhaps the list should be larger … and perhaps by gender as well as cannabis business focus or channel … innovation and value focused on dispensary, cultivation, extraction/production, real estate, investment, etc. More inclusive but more focused would engage a wider audience in my opinion? BudTrader is going to win the green rush as long as the hot head CEO stops trying to throw parties and focuses on building the company. They’ll probably acquire Massroots and once Weedmaps gets shut down , it’s over.